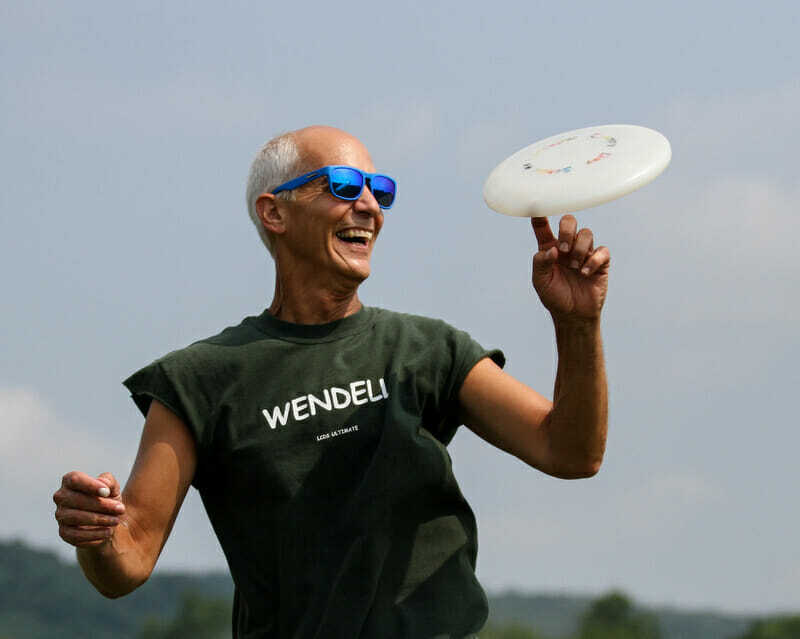 This article was contributed by Ken Westerfield, a Hall of Fame inductee in freestyle, ultimate, and disc golf. He held the MTA world record in 1975, in addition to inventing freestyle moves and introducing the first freestyle competition in 1974. He was pivotal in introducing ultimate in Canada, including winning the first Canadian National Ultimate Championship in 1987. To improve playing skills in any sport, it helps to include training activities that can isolate and improve every playing skill that is required for that sport. All ball sports encourage cross-training to improve strength and skills for their primary competition. Ball athletes will regularly choose sports that are similar to their sport for cross-training. Similarly, all disc sports have specific disc skills that are related to ultimate and are excellent as cross-trainers for athletes playing ultimate. Developing the playing skills of other disc sports will help to improve and maintain primary skills used in ultimate. I don’t think this was common knowledge for players in the early days; we just played all of the disc sports. It was the beginning of discovery and invention. But in hindsight, it’s not hard to see how all the disc sports contributed to advances in ultimate. There were clear benefits: disc golf for hucking, pulling, and accuracy; freestyle and double-disc court (DDC) for all handling skills; and guts for extreme one-hand catching and power throwing. Even if you played all of these disc sports with their regulation disc models instead of a 175g ultimate disc, it could be very beneficial as a cross-training option — not to mention all of these other disc sports are fun and have their own unique challenges! It may be half a century later, but the same still applies. Ultimate is fast becoming the breakout disc sport of the future. Although I would never want to see freestyle moves included in the game of ultimate, I would like ultimate players to consider the playing benefits that can come from freestyle as a handling exercise. Guts Frisbee was our first organized disc sport, but throw-and-catch freestyle was Frisbee’s first activity, eventually creating competitions; the touring freestyle performers in the 1970s showed people that the Frisbee was more than just recreation with a beach toy. Competitive disc sports like ultimate and disc golf are excellent flying disc sports that have grown in popularity, but as a skilled activity, there’s nothing more uniquely self-challenging to playing with a flying disc than freestyle in every form. The earliest introduction of ultimate games popularized by Jared Kass and Joel Silver with friends in high school were played as a backhand passing and mostly two-hand catching camp activity. But many of ultimate’s earliest promoters (the Johnny Appleseeds) became excellent disc athletes and some became very accomplished freestylers in the early 70s. Freestylers invented and developed most if not all of the advanced throwing techniques that are used in today’s ultimate game. Freestylers were some of the sport’s first good handlers and early innovators, introducing the big throwing styles that make ultimate the fun passing game it is today. Freestyle today is a unique training, not necessarily for turning ultimate players into freestylers, but simply as an excellent cross-trainer for improving an ultimate player’s skills for handling the disc. Since there are elements of freestyle play in every disc sport, disc athletes, especially in ultimate, should consider a simple form of regular freestyle play as recreation and handler practice. There are a number of YouTube videos showing freestyle, but most focus on air-bounce throws and nail-delay moves. This isn’t the type of freestyle you are looking for. The non-use of delay-aids (plastic nails and silicone sprays) will put you on the right path for a throw and catch fast-freestyle and handling exercise. Freestyle doesn’t have to be a strict practice, although it can be. It could also just be more of an experimental (freestyle) attitude whenever you feel like playing with the disc as recreation or warm-up. Having a specific exercise for practicing just your disc skills along with your ultimate play will help you to develop excellent handling skills. I’ve seen videos that are being produced by a few of today’s elite ultimate players of their versions of uncommon throwing possibilities. Rowan McDonell’s is a shining example; although he demonstrates a few new variations, most are throws that we used in early freestyle. We lumped them together as “freestyle throws” and they were a big part of playing freestyle prior to 1975. This is the type of freestyle throwing that I recommend for a throw-and-catch freestyle handle exercise. Becoming a cutting threat with a variety of throwing techniques that can attack with the disc before the defense has a chance to reset is highly effective, as McDonnell has demonstrated in his success. A fast-freestyle throwing and catching practice will not only improve the variety of your throws, but also quicken your ability to transition between your catch and throwing readiness. The throws you know today as ultimate throws — backhand, sidearm (forehand), hammer — before ultimate, are what we use to call basic freestyle throws. Trying freestyle throwing variations of these common ultimate throws, like under-the-leg or behind-the-back flicks or forehand and backhand high-arching curves and skip shots, will expand your throwing range and strengthen your throwing skills. Even though you’re highly unlikely to use all of these throwing variations specifically in game situations, just adding these freestyle throwing variations in practice will improve your abilities, especially for beginning and intermediate players. They also prepare you for playing in adverse conditions like wind, rain, cold, or just against a great defense. Ultimate players might wonder what freestyle catching has to do with two-hand rim and clap catching. There’s little to be gained in that area, but freestyle can give you the one-hand catching skill and confidence to not always have to rely on two-hand catching. Some of the time when you’re running down the ultimate field under a disc about to make a catch, a two-handed rim or clap catch is not always possible or the best idea, especially if there is a defender on you. You sometimes have to rely on an obstructed one-hand catch, with your defender being the obstruction. In fast-freestyle, one-hand catches are always obstructed by your own body, with many catches actually being blind (when you actually can’t see the disc go into your hand). When I played ultimate, my question to my team would always be, “Why do you use two hands to catch?” Many would answer that they were afraid to drop it. Wrong answer. I’d instruct them on the physics involved in catching the spinning disc with either hand. Freestyle catching is a one-hand catching practice for catching a spinning disc in any situation. Some basic freestyle catches are: behind-the-back, behind-the-head, under one or both legs, forwards or backwards. All of these catches can also be done while jumping, running, or spinning. When practicing, adding freestyle catching to the throws you already know is a great way to practice one-hand catching the disc on the correct side of the spin in many different positions. You can watch early freestyle champion Krae Van Sickle demonstrate some of these techniques. Freestyle isn’t a separate game or activity, it’s a skillset that will up your throwing and catching game, especially with quick throwing variety and one-hand catching situations. For the ultimate player that already has excellent handler skills, it could just be an interesting way to improve and maintain them. For the ultimate player just starting out, it could be an additional and fun way to obtain them. In the future, when ultimate teams are looking for every competitive edge, I have no doubt that a throw and catch version of freestyle will be an integral part of ultimate players practice and recreation. Sometimes, it’s helpful to look backward to see how to move forward. Comments on "Tuesday Tips: How Freestyle Can Improve Your Handling Game, Presented by Spin Ultimate"